Volatility in commodity prices have led to a significant dislocation between market and fundamental valuations around the world. As the long-term demand for natural gas continues to rise, our Global Listed Infrastructure team took some time to share their thoughts on the future of the industry, including which companies look best positioned to capitalise on the compelling trends that are unfolding in the market. Over the next 25 years, the world's population will increase by 1.8 billion and global GDP will double*, driving an increase in world energy consumption. Due to environmental and cost factors, natural gas will meet much of this growing energy demand. 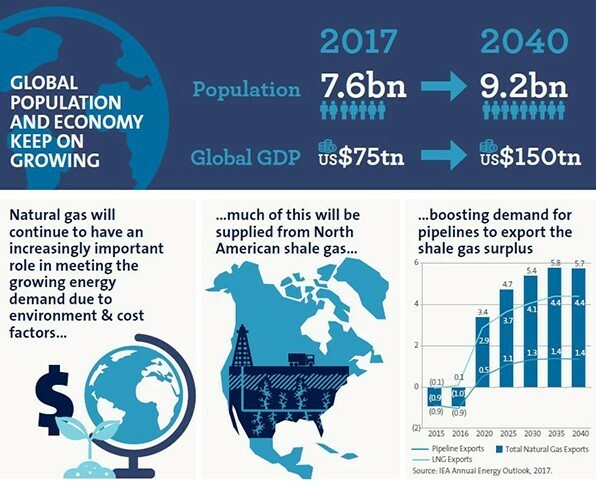 North American shale gas reserves are set to deliver much of the increase in natural gas production, where improving extraction (fracking) technology is enabling profitable exploitation. Businesses active in this market benefit from stable and high quality cash flows, supported by large and diversified networks, strong regulation, and fee-based contracts. Companies engaged in extraction and processing have outperformed pipeline businesses, however they are exposed to sudden swings in the crude oil price and face a more volatile cost of capital. Historically and rationally, higher quality long haul gas pipeline companies have traded at a market premium that reflects their attractive dividend yield and lower correlation to commodity prices, therefore we believe the current discount at which these businesses are valued is unlikely to be sustained over the long term. We believe the current price dislocation is unlikely to be sustained over the long-term, creating a compelling value opportunity for investors. To capitalise on this opportunity, we have made an allocation to companies such as Kinder Morgan (NYSE: KMI) - the largest energy infrastructure company in North America with 84,000 miles of pipelines, in AMP Capital’s Global Infrastructure Securities Fund trading on the ASX with ticker code GLIN. However, investing in a single company as stand-alone trade presents risks and a requires a deep understanding of the business. You can view the full infographic here, as well as the full white paper here.